In recent years, a myriad of surgical protocols have been developed to manage atrial fibrillation, increasing the confusion over which are the most effective approaches. This timely book presents a multidisciplinary, international team of authorities who have reviewed the evidence in order to establish which surgical approaches should be used under which circumstances. 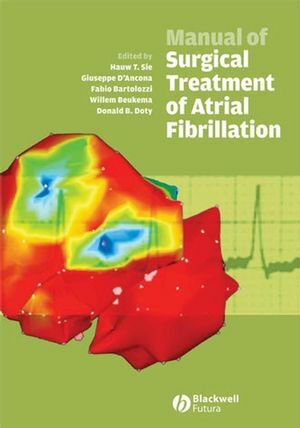 With its clear presentation and analysis of the current findings in surgical treatment of atrial fibrillation, this book points the way towards a scientific approach for the surgical cure of atrial fibrillation and is essential reading for all cardiac surgeons. Part I Anatomy, pathophysiology, and electrophysiologic basis of atrial fibrillation. 1 The morphology and development of the atrial chambers, with particular regard to. atrial fibrillation: Robert H. Anderson (University College, London,), Antoon F. Moorman (University of Amsterdam), Andrew Taylor (University College, London), & Siew Yen Ho (Imperial College and Royal Brompton and. 2 Pathophysiology of atrial fibrillation: Robert A. Byrne (University College Hospital, Galway) & Kieran Daly (University College Hospital, Galway). 3 Genetics of atrial fibrillation: Ramon Brugada (Isala Klinieken, Zwolle). 4 Pharmacological management of atrial fibrillation: Yvonne Smyth (University College Hospital, Galway) & Kieran Daly (University College Hospital, Galway). 5 Electrophysiological basis of atrial fibrillation:Sander Verheule (Maastricht University), Thomas van Brakel (Maastricht University), Erik Harks (Maastricht University),. Maura Greiser (Maastricht University) & Maurits Allessie (Maastricht University). 6 Pulmonary and thoracic vein sources: the focal theory of atrial fibrillation: Prashanthan Sanders (Hôpital Cardiologique du Haut-Lévêque; and Université Victor Segalen Bordeaux II), Mélèze Hocini (Hôpital Cardiologique du Haut-Lévêque; and Université Victor Segalen Bordeaux II),. Pierre Jaïs (Hôpital Cardiologique du Haut-Lévêque; and Université Victor Segalen Bordeaux II), Yoshihide Takahashi (Hôpital Cardiologique du Haut-Lévêque; and Université Victor Segalen Bordeaux II), Thomas Rostock (Hôpital Cardiologique du Haut-Lévêque; and Université Victor Segalen Bordeaux II),. Fréderic Sacher (Hôpital Cardiologique du Haut-Lévêque; and Université Victor Segalen Bordeaux II), Anders Jonsson (Hôpital Cardiologique du Haut-Lévêque; and Université Victor Segalen Bordeaux II), Martin Rotter (Hôpital Cardiologique du Haut-Lévêque; and Université Victor Segalen Bordeaux II),. Li-Fern Hsu (Hôpital Cardiologique du Haut-Lévêque; and Université Victor Segalen Bordeaux II), & Michel Haïssaguerre (Hôpital Cardiologique du Haut-Lévêque; and Université Victor Segalen Bordeaux II). Part II Surgical approach to atrial fibrillation. 7 Surgical treatment of atrial fibrillation: a retrospection: Gerard M. Guiraudon (University of Western Ontario). 8 The maze procedure: past, present, and future: Niv Ad (Inova Heart and Vascular Institute). Part III Modifications of the Cox-maze, use of alternative surgical patterns, and energy sources. 9 The radial procedure for atrial fibrillation: theoretical basis and clinical application: Takashi Nitta (Nippon Medical School, Tokyo). 10 The mini-maze operation: Z.A. Szalay (Kerckhoff Clinic Foundation, Bad Nauheim). 11 Alternative energy sources for the surgical treatment of atrial fibrillation: Mark J. Russo (Columbia University) & Mathew R. Williams (Columbia University). 12 Radiofrequency modified maze surgery for chronic atrial fibrillation and concomitant cardiac surgery: Zwolle experience:. Hauw T. Sie (Isala Klinieken, Zwolle), Willem P. Beukema (Isala Klinieken, Zwolle), Arif Elvan (Isala Klinieken, Zwolle), Hacer Sen (Isala Klinieken, Zwolle), Anand Ramdat Misier (Isala Klinieken, Zwolle),. Giuseppe D’Ancona (ISMETT @ UPMC Mediterranean Institute for Transplantation and Advanced Specialized Therapies, Palermo), & Fabio Bartolozzi (Galway Clinic). 13 Bipolar radiofrequency ablation of atrial fibrillation: A. Marc Gillinov (The Cleveland Clinic Foundation). 14 Surgical ablation therapy using microwave energy: endo- and epicardial approach: Michael Knaut (Heart Center Dresden, University of Technology Dresden) & Stefan Brose. 15 Epicardial ablation in the treatment of atrial fibrillation: Stefano Benussi (San Raffaele Hospital, Milan) & Ottavio Alfieri (San Raffaele Hospital, Milan). 16 Surgical treatment of atrial fibrillation: the Japanese experience: Yoshio Kosakai (Takarazuka Municipal Hospital). 17 Minimally invasive surgical approach to treat atrial fibrillation: Mustafa Güden (Florence Nightingale Hospital, Sisli), Belhhan Akpınar (Florence Nightingale Hospital, Sisli) & Osman Bayındır (Florence Nightingale Hospital, Sisli). Part IV The invasive cardiologist approach. 18 Percutaneous treatment of atrial fibrillation: Carlo Pappone (San Raffaele University Hospital, Milan) & Vincenzo Santinelli (San Raffaele University Hospital, Milan). 19 Surgical ablation of arrhythmias associated with congenital cardiopathies: Nestor Sandoval (Cl´ınica A. Shaio and Fundaci ´on Cardio-Infantil, Bogotá), Fernando Rosas (Cl´ınica A. Shaio and Fundaci ´on Cardio-Infantil, Bogotá), & Victor Manuel Velasco (Cl´ınica A. Shaio and Fundaci ´on Cardio-Infantil, Bogotá). Part V Perioperative Complications, Reporting Results, and Statistical Analysis. 20 Perioperative complications during surgical treatment of atrial fibrillation: tips and pitfalls: Nicolas Doll (University of Leipzig), Alexander M. Fabricius (University of Leipzig),. Virginia Dietel (University of Leipzig), Piotr Suwalski (University of Leipzig), Thomas Walther (University of Leipzig), Jan F. Gummert (University of Leipzig), & Friedrich W. Mohr (University of Leipzig).